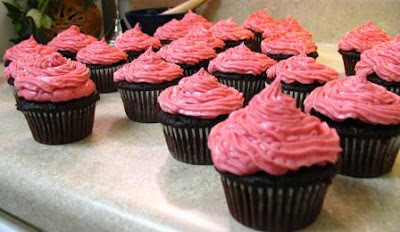 So after last Friday's cupcake fiasco, I wasn't about to allow these little bastards to kick my posterior. I have to admit I'm still not a fan of the cupcake, but this updated version came close to making me a convert. They're a dark chocolate and stout beer cake base (just try it, you'll never have chocolate cake without it again! ), filled with an addictive amaretto chocolate mousse, and topped with enough sugary frosting to send you into a diabetic coma. Start with the filling, it will need to to set-up. 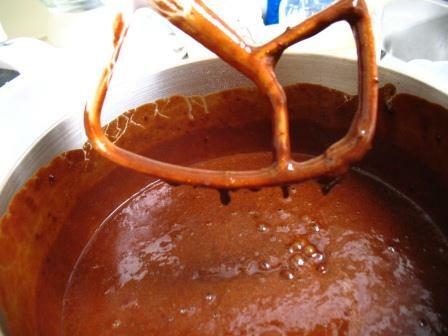 Pour the powdered mousse into the bowl of a stand mixer (a hand mixer may be substituted). With the mixer on slow, pour the milk and amaretto into the bowl, scrapping down the side as necessary. Mix for approximately 4 minutes. Transfer to an airtight bowl, and refrigerate for at least 2 hours. 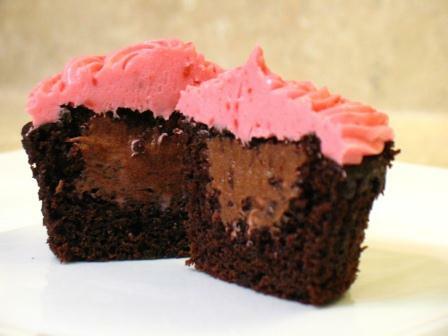 While the mousse is resting, prepare the cupcakes. Preheat the oven to 350 degrees. Line 2 standard muffin tins with paper cupcake/ muffin liners. Whisk together the flour, sugar, baking powder, baking soda, and cocoa in the bowl of a stand mixer. Pour the beer into a pan on the stove and bring to a mild simmer (BE VERY CAREFUL, boiling beer has a tendancy to expand rapidly). With the mixer on slow, add the oil, milk, vanilla extract, and whiskey to the flour and cocoa mixture. Blend until smooth. Add the eggs one at a time, blending after each addition. Immediately after adding the eggs, add the salt and dark chocolate chips to the simmering beer and bring to a rolling boil, stirring constantly. Carefully pour the beer into the batter stirring constantly (this is where having a stand mixer pays off). Blend until everything is incorporated. 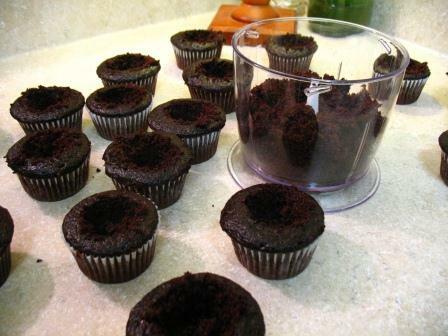 Pour the batter into the paper lined muffin tins, filling 3/4 of the way up the sides of the cup. 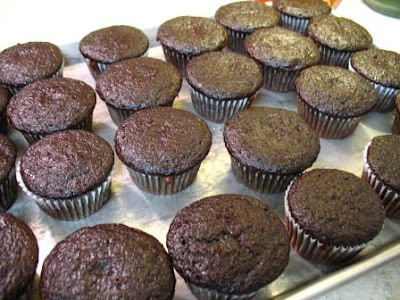 Bake in the preheated oven for 20 minutes, or until a toothpick inserted into one of the interior cupcakes comes out free of batter. Remove the pans from the oven and allow them to cool on a baking rack for approximately 10 minutes. Then gently pry the cakes out of the tins, and return them to the rack to cool until they reach room temperature. While the cakes are cooling, start on the frosting. Whip the softened butter until light and fluffy. Add the raspberries, and blend until creamy. Add the vanilla and salt. In small portions, begin adding the powdered sugar. Continue adding and mixing the powdered sugar until it has all been blended into the frosting. Cover the bowl with plastic wrap, and reserve until ready to use. Once the cakes have cooled, start the cake-o-suction process. Take a sharp knife, and cut out a conical hole in the top of the cake. Save the innards, we'll use them later. 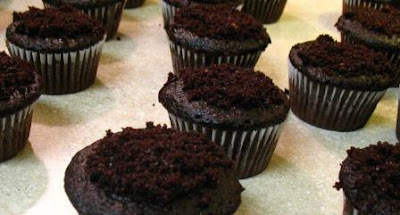 Place the remnants of the cupcakes into the bowl of a food processor fitted with a steel blade. Add approximately 4 Tbs. of granulated sugar to the cake crumbs (an old Julia Child trick for grinding nuts). Pulse for 5-6 seconds until evenly crumbled. 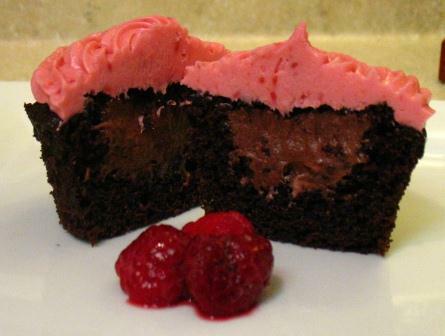 Transfer the mousse to a pastry bag fitted with a wide tip, and pipe the filling into the cupcake holes. Sprinkle the crumbs over the filling, tapping down lightly with the back of a spoon. 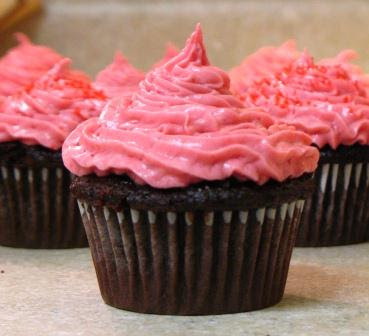 Transfer the frosting to a pastry bag fitted with your preferred tip, and pipe onto the top of the cakes. Enjoy, and happy Valentines Day! These are soo pretty! I never would have thought to put pink on chocolate but it works! And the alcohol!